So far, companies were to satisfy their Statutory Auditors about the adequacy of Internal Controls related to purchase of inventory and fixed assets and sale of goods and services for Auditor’s reporting under CARO. However, in case of listed company, Clause 49 of the Equity Listing Agreement requires that CEO and CFO of listed companies to certify to the board of directors that they accept responsibility for establishing and maintaining internal controls for financial reporting and that they have evaluated the effectiveness of internal control systems of the company pertaining to financial reporting. The Companies Act, 2013 has stated specific responsibilities on the board of companies towards the company’s internal controls and, inter alia, requires the board to state that they have laid down internal financial controls to be followed by the company and that such internal financial controls are adequate and were operating effectively. Statutory auditor of company will be giving a separate report on the adequacy and effectiveness of Internal Financial Control over Financial Reporting with effective from Financial Year 2015-16. Compliance of Clause 49 of the Listing agreement will continue to be complied by the listed companies. Rule 8(5)(viii) of Companies Accounts Rules, 2014 Board Report Board’s report to include the details in respect of adequacy of internal financial controls with reference to the financial statements. 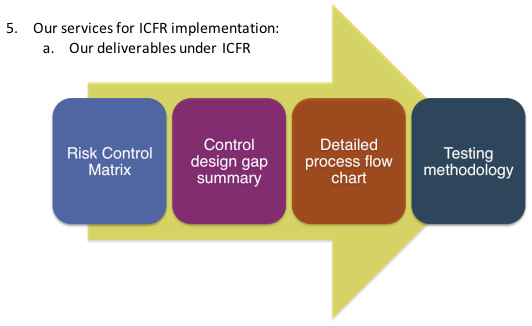 Guidance note issued by ICAI in September’2015 has borrowed the definition of Internal Financial Control over Financial Reporting (ICFR) from Auditing Standard (AS) 5, An Audit of Internal Control Over Financial Reporting that Is Integrated with An Audit of Financial Statements issued by the Public Company Accounting Oversight Board (PCAOB), USA. 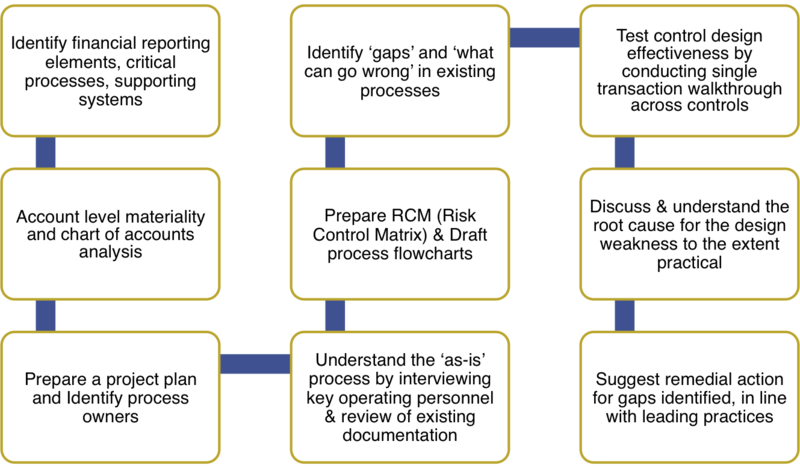 Co-develop remediation plans for testing gaps by engaging process owners.